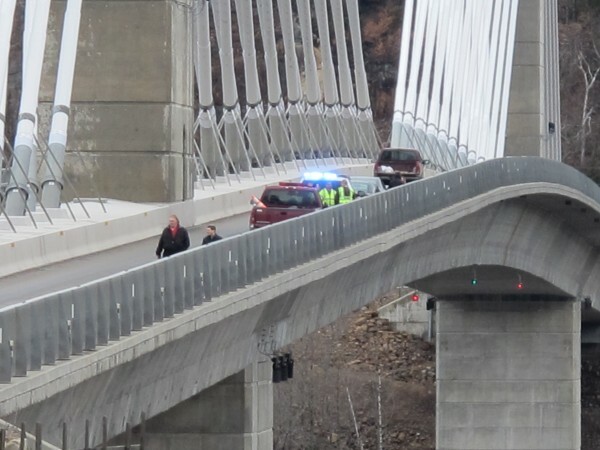 Law enforcement and emergency responders converged on the Penobscot Narrows Bridge around noon Monday, April 1, 2013, after a man jumped off the bridge in an apparent attempt at suicide. 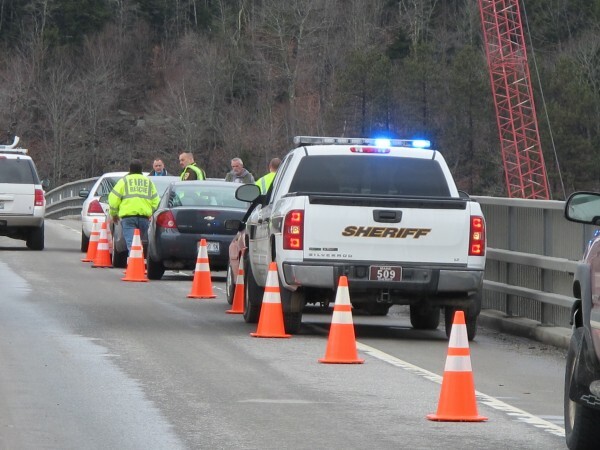 PROSPECT, Maine — An Eddington man is dead after jumping off the Penobscot Narrows Bridge around noon Monday in an apparent suicide. Waldo County Chief Sheriff’s Deputy Jeff Trafton identified the man as 25-year-old Brandon Cossette. Cossette did not survive the jump and was pronounced dead at the scene. Trafton said eyewitnesses included Cossette’s parents. Information about Cossette’s mental state and what caused him to leap into the Penobscot River was not immediately available. It is unclear whether the victim’s parents were traveling with Cossette or in another vehicle. Bucksport Fire and Ambulance were called to the scene, as were emergency responders from Prospect and Verona. But it was a crew working on the demolition of the old Waldo-Hancock Bridge that recovered Cossette’s body from the Penobscot River. “Initially, we were contacted for a boat, but with construction going on, there were a couple boats over there and the construction crew actually made the retrieval,” said Bucksport Fire Chief Craig Bowden. Monday’s was the first suicide on the Penobscot Narrows Bridge since the Rev. Robert Carlson jumped to his death in November 2011 after learning he was under investigation for child abuse. According to Bangor Daily News report published one year before Carlson’s death, the Waldo-Hancock Bridge was frequently the site of suicide attempts. When Maine Department of Transportation officials replaced the span with the Penobscot Narrows Bridge, pedestrian safety was discussed at length, but no special fencing was installed. BDN reporter Abigail Curtis contributed to this report. Follow Mario Moretto on Twitter at @riocarmine.